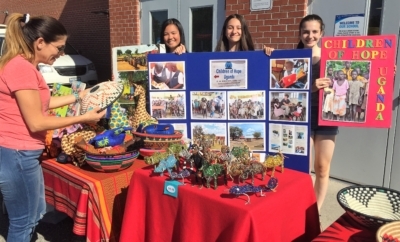 Children of Hope Uganda sells beautiful, unique, handmade Ugandan crafts ie recycled paper jewelry, baskets, stuffed animals and sewn crafts to raise funds for its nursery school and vocational school in northern Uganda. Won’t you join us in supporting the education of children and war-affected youth, including many former child soldiers? Please contact COHU founder and former teacher, Lorna Pitcher to discuss how to invite COHU to your school’s Holiday concert, Fun Fair or other events. Sharing the proceeds will be a win-win for your students and the Ugandan students. The added benefit? …….engaging your students in the joy of global citizenship. Opiyo Oloya, Superintendent, York Catholica District School Board endorsed Children of Hope Uganda in his keynote speech to the Luke 4:18 Symposium at the Catholic Education Centre, Newmarket in April, 2016. Lorna Pitcher delivered the Barton Lecture on Community Service at Upper Canada College in Oct 2014. Lorna Pitcher was awarded the Paul Harris Award for her work in Uganda in July, 2012 by the Kitchener-Conestoga Rotary Club.